I think my wife would love this as a desktop background. Purple is her favourite color. I must admit that I am wondering what is growing inside the eggs/bubbles. 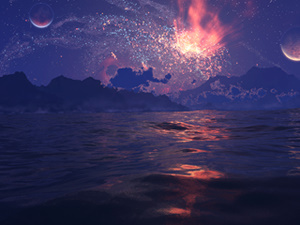 The bubbles - what if you put a distorted landscape from some of your other art inside, as if it were held in that bubble in stasis? I like this one Ryan. its on my work desktop. keep it up bro. I agree with the previous comment that it's a little busy. I have it as my wallpaper on three monitors now, awaiting the triscreen. I like it, but not one of my faves. Probably back to the Dahlias, later. Interesting contrast of both life and death as well as dark and light. on my Galaxy S8+, the purple ball looks like it might explode into some kind of creepy alien life-form. I like it better on other screens. Please give multiscreen renders! This is my favourite in quite some time. 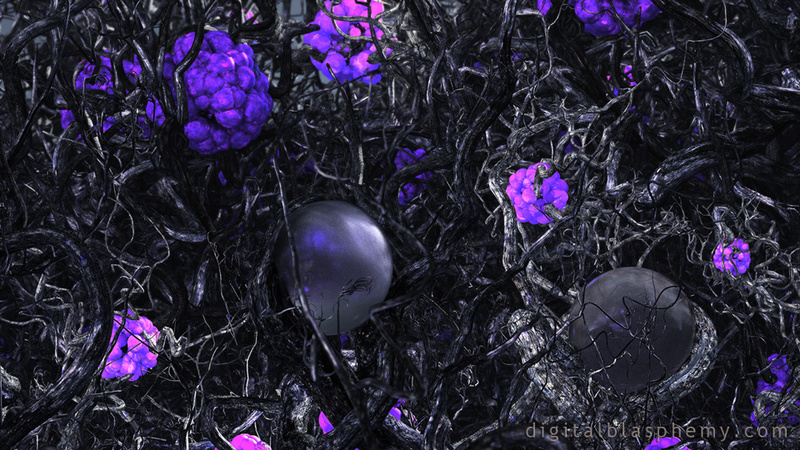 Love the purple colours in this, against the black and grey, really eye catching, Great detail also, awesome render. Ryan I like this. I don't know what the hell it is but I like it. The UV purple really pops. I'm sure you will turn it into something amazing sooner or later.